Analog Way announced the acquisition of Picturall, a well-established manufacturer of high performance media servers based in Finland. Analog Way is an internationally renowned manufacturer of high-end video processors, dedicated to premium niches in commercial audio-video presentation markets. This acquisition brings together two innovation champions of the Pro AV industry, with aim of merging their synergistic core competencies into new and exciting turn-key solutions for their staging and fixed installations customers. With the acquisition of Picturall, Analog Way adds heavy-duty media servers to its current product portfolio of high-end real-time video processors and thus strengthens its position as market leader in the design and manufacturing of mission critical high-performance presentation solutions. 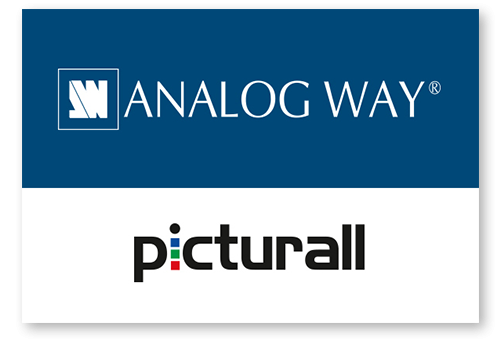 Adrien Corso, Analog Way’s CEO, states “We are pleased to welcome Picturall‘s team in the Analog Way group. They are young veterans of the media server industry and genuine experts of media management technologies. We are proud to expand our product portfolio with Picturall’s media server solutions. Their reputation for reliability and high performance perfectly aligns with our product development philosophy. Complementarity between our product platforms and applications shall offer us tremendous opportunities to better serve our customer base”. “Picturall media servers will benefit from Analog Way’s reputation, expertise and investment capacity”, adds Vesa Laasanen, Co-founder of Picturall. “Analog Way’s sales and service network shall afford us access to markets not currently being tapped or highly underserved. Our engineers are already envisioning a plethora of ideas for new products. Joining Analog Way will most certainly allow us to jump to the next level”. Consult both companies’ web sites www.analogway.com and www.picturall.com to find out more.